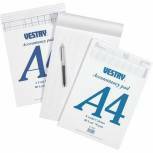 Vestry 8-Column Accountancy Pad A4 CV2064 Pack of 1 Size: A4 (210x297mm). 8 cash columns. Keep accurate and precise records. Collate and organise financial records. 80 sheets of 70gsm. Ruled on one side only. 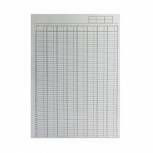 Q-Connect 8-Column Analysis Pad A4 KF01082 Pack of 1 Q-Connect Analysis Pad. 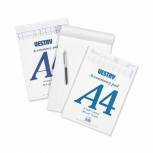 High quality accounts pads numbered vertically on each sheet, each pad contains 80 sheets. Size: A4. 8-Column. 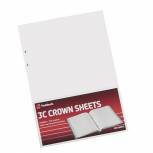 Rexel Crown 3C F1 Double Ledger Refill Sheets (Pack of 100) 75841 Pack of 1 Double ledger 100 sheet refill pack. Loose leaf for individual personalisation. Designed for use with Crown 3C binders. 229 x 324mm. High quality loose leaf system. 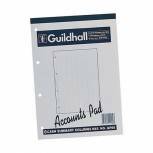 Guildhall 2-Column Cash Account Pad A4 GP2 Pack of 1 Guildhall Account Pad. Quality White wove paper, printed with line and column numbers, plus a reference box at the head of the sheet. Each pad contains 60 sheets and is punched 4 holes. Leaf size 298x210mm. 41 feint lines, ruled 2 Cash Columns. 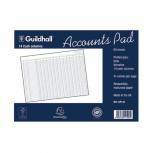 Guildhall 6-Column Cash Account Pad A4 GP6 Pack of 1 Guildhall Account Pad. Quality White wove paper, printed with line and column numbers, plus a reference box at the head of the sheet. Each pad contains 60 sheets and is punched 4 holes. Leaf size 298x210mm. 41 feint lines, ruled 2 Cash Columns. 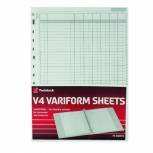 Rexel Variform V4 4-Column Cash Refill (Pack of 75) 75930 Pack of 1 4 column cash sheets. Pack of 75 pages. Loose leaf for individual personalisation. Designed for use with multi-ring binders. 297x210mm. 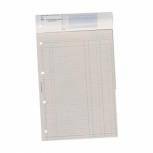 Rexel Variform V4 6-Column Cash Refill (Pack of 75) 75932 Pack of 1 6 column cash sheets. Pack of 75 pages. Loose leaf for individual personalisation. Designed for use with multi-ring binders. A4. 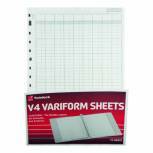 Rexel Variform V4 7-Column Cash Refill (Pack of 75) 75933 Pack of 1 7 column cash sheets. Pack of 75 pages. Loose leaf for individual personalisation. Designed for use with multi-ring binders. A4. Rexel Variform V5 10-Column Cash Refill (Pack of 75) 75964 Pack of 1 10 column cash sheets. Pack of 75 pages. Loose leaf for individual personalisation. Designed for use with multi-ring binders. 297x279mm. Rexel Variform V8 10-Column Cash Refill (Pack of 75) 75982 Pack of 1 10-column cash sheets. Pack of 75 pages. Loose leaf for individual personalisation. Designed for use with multi-ring binders. 297x356mm. Rexel Variform V8 12-Column Cash Refill (Pack of 75) 75983 Pack of 1 12-column cash sheets. Pack of 75 pages. Loose leaf for individual personalisation. Designed for use with multi-ring binders. 297x356mm. 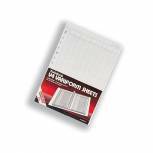 Rexel Variform V8 14-Column Cash Refill (Pack of 75) 75984 Pack of 1 14-column cash sheets. Pack of 75 pages. Loose leaf for individual personalisation. Designed for use with multi-ring binders. 297x356mm. Rexel Variform V8 24-Column Cash Refill (Pack of 75) 75985 Pack of 1 24-column cash sheets. Pack of 75 pages. Loose leaf for individual personalisation. Designed for use with Twinlock multi-ring binders. 297x356mm. 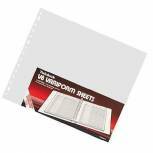 Rexel Variform V8 32-Column Cash Refill (Pack of 75) 75986 Pack of 1 32-column cash sheets. Pack of 75 pages. Loose leaf for individual personalisation. Designed for use with Twinlock multi-ring binders. 297x356mm. Rexel Variform V8 4 Debit 16 Credit Petty Cash Refill (Pack of 75) 75990 Pack of 1 Petty cash sheets. Pack of 75 pages. Loose leaf for individual personalisation. Designed for use with Twinlock multi-ring binders. 297x356mm. 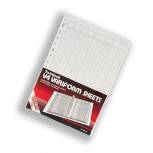 Rexel Variform V4 14-Column Cash Refill (Pack of 75) 75934 Pack of 1 14 column cash sheets. Pack of 75 pages. Loose leaf for individual personalisation. Designed for use with multi-ring binders. A4. 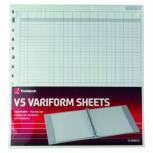 Rexel Variform V4 F1 Double Ledger Refill (Pack of 75) 75951 Pack of 1 Double ledger sheets. Pack of 75 pages. Loose leaf for individual personalisation. 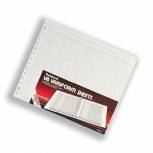 Designed for use with Twinlock multi-ring binders. A4. Guildhall Account Pad 8-Column Summary A4 GP8S Pack of 1 Guildhall Account Pad. Quality White wove paper, printed with line and column numbers, plus a reference box at the head of the sheet. Each pad contains 60 sheets and is punched 4 holes. Leaf size 298x210mm. 54 feint lines, ruled 8 Summary Columns. 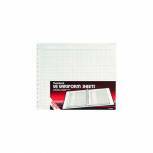 Guildhall 14-Column Cash Account Pad 298x406mm GP14 Pack of 1 Guildhall Account Pad. Quality White wove paper, printed with line and column numbers, plus a reference box at the head of the sheet. Each pad contains 60 sheets and is punched 4 holes. Leaf size 298x406mm. 41 feint lines, ruled 14 Cash Columns.